As part of the Inn on Mill Creek’s 10th birthday celebration, The Inn Turns 10!, we’re doing all kinds of things with the number 10, including participating in microloans to 10 small business owners in developing countries through Kiva. We, along with like-minded folks in states like New York, Connecticut, Ohio, Illinois and Michigan and countries like Germany, Norway, Australia and Japan, separately put our money into one microloan to Marcos in Honduras. Marcos is 45 years old and has been making furniture for 12 years. He is a positive force in his local community, employing six other residents in his town. 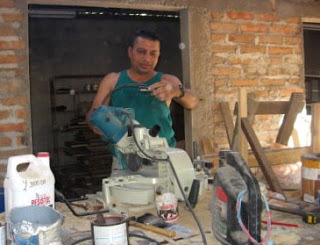 The microloan to Marcos will help him to buy materials for his work so that he can continue building his dream of having a store where he can sell his furniture. You can learn more about the other small business owners that we’ve loaned to on our Inn Turns 10 page.